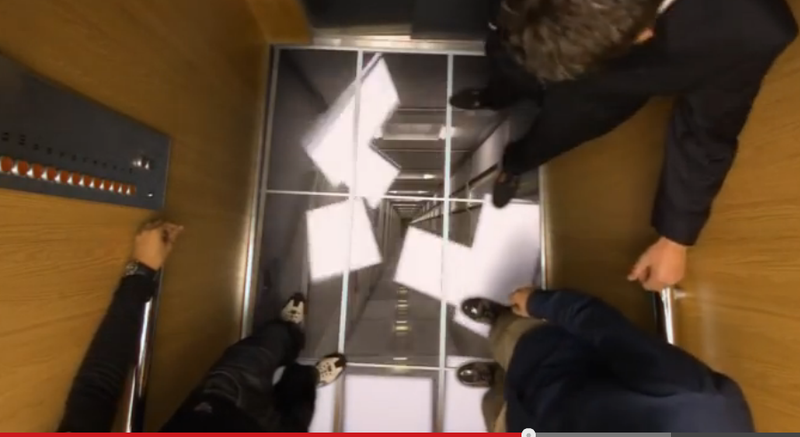 In case you can't view it, they setup the elevator floor with monitors, then make a rumbling and the video "cuts away" to look like the floor is collapsing. 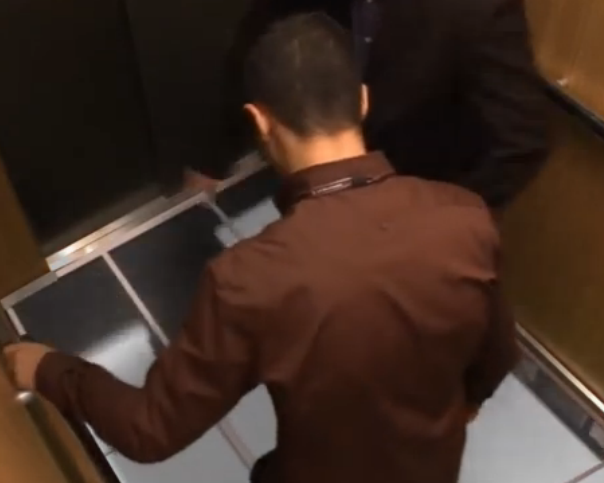 Besides the obvious fact that you wouldn't need particularly good picture quality to believe, for the couple seconds required, that the floor was giving 'way (indeed, many of the YouTube clips are being posted at 240 resolution! ), what caught my eye was that chicks aren't good at self-preservation. 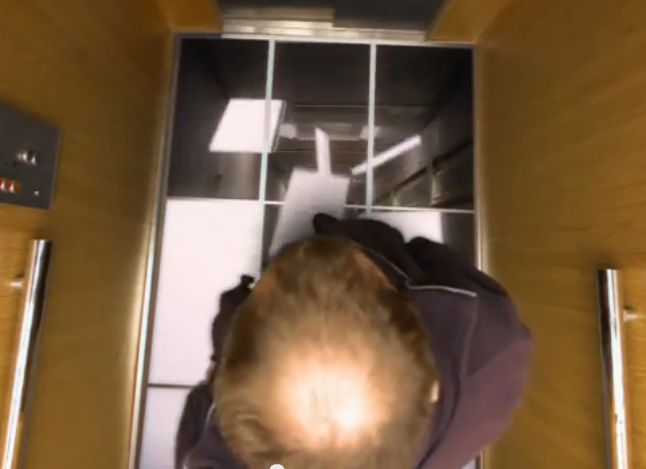 First let's look at Guy 1: the floor starts "giving way" top to bottom (all directions will be from the perspective of we the viewer unless otherwise noted), and he immediately steps downwards away from the falling tiles. It isn't a quarter second before he realizes it's fake and stops moving. 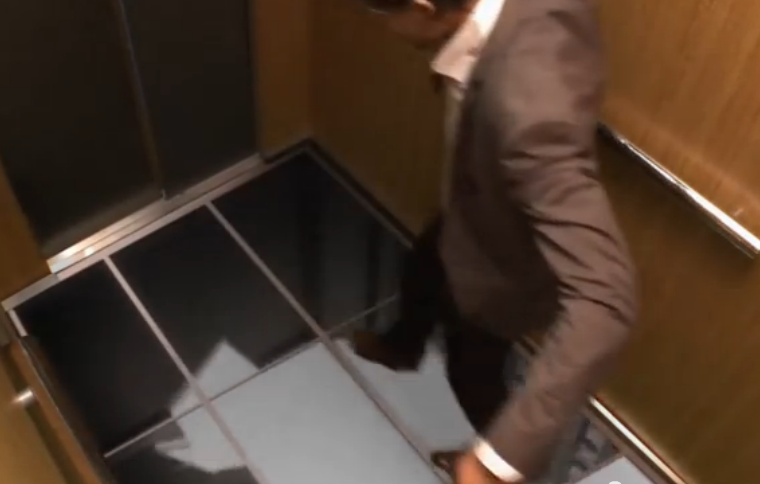 Guys 2 and 3 are in the elevator together: Guy 2 at the top right has his tiles fall before he even looks down, he backs up against the wall for support while Guy 3 at the bottom leaps back to the remaining "good" tiles. 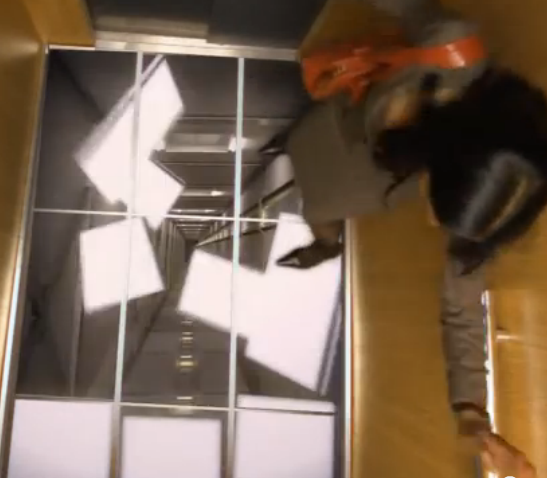 Since Guy 2 isn't falling, they both clue in quickly that it's a prank. 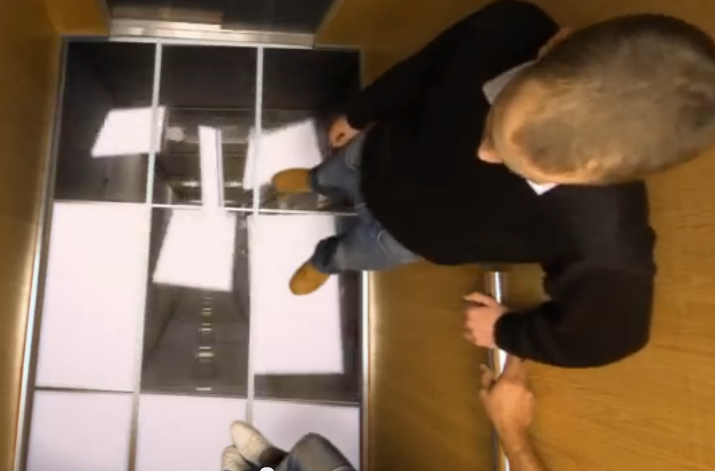 Guys 4,5,6 are all in the elevator together: again, Guy 4 at the top should be falling by the time they notice the floor, so no real reaction is possible here. Guy 4 jumps up a little bit. They really shouldn't have even bothered including this run on the ad, it really didn't push the illusion that they fooled anybody. In fact, this is a great demonstration of how the illusion was too fast...even if you bought the scenario it's hard to be convinced you're in danger while your buddy is standing there on thin air. Guy 7 does really well: he looks down to see the tiles falling in an upper left to lower right progression, and immediately jumps back to the "safe" tiles behind him. Guy 8 and 9 are together: 8 in the upper right sees his tile fall away, and leaps to a safer tile behind him and hugs the wall. Guy 9, like Guy 7, immediately leaps back against the tiles last to fall. I like that all of the men in this video were heroes in what J. Michael Straczynski calls the "Heinleinian tradition": sure I'm about to fall dozens of stories, but by standing here I gain precious milliseconds I can use to figure out a way out of this situation. Keep that in mind, the contrasts are about to be striking. Now we come to the ladies. Chick 1 sees the tiles falling starting in the upper left. She's standing on a tile yet to fall, yet jumps to her right to leap onto a tile that's already falling! As she watches tiles fall away, she continues to run away from the yet-to-fall tiles. Chick 2, like Chick 1, leaps to the upper right tile as she's watching the tiles fall from upper-left to lower-right. In fact, she's so close to as bad at this as Chick 1 I had to re-watch to confirm they were in fact different girls. (Chick 1 is hotter). This covers so many things, from why women are homo acerbia to why men are so predominantly the authors and subjects in heroic drama. It's right there in the TV ad campaign, folks. We're just better at it.